There’s been a great deal of excitement in the air surrounding Apple’s introduction of the new Apple TV. The black set-top box, which now sits proudly in its fourth-generation, is intended to reinvigorate the media experience in the living room by introducing a dedicated App Store that has a strong focus on media rich apps and purpose built gaming experiences. It seems that Apple’s focus has been rewarded, with a new report suggesting that the Cupertino-based company now has a larger market share than Amazon, Google, and Roku in that particular space. The worldwide set-top box market is nowhere near the size of other markets that Apple finds itself involved in, such as the smartphone or tablet verticals. With that said, every market comes with its own challenges to overcome and its own set of consumers that are literally waiting to be blown away by a new product. 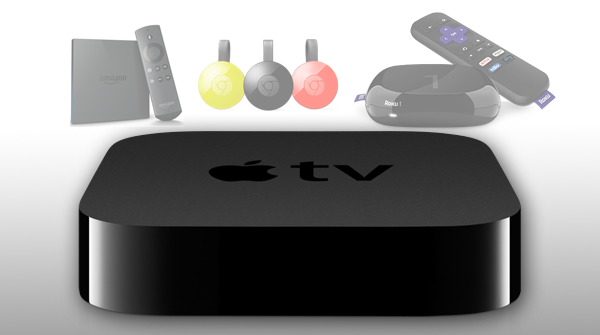 The report suggests that Apple’s fourth-generation Apple TV has instantly resonated with those consumers, and in turn has provided the company with a 31-percent share of the streaming hardware market in the United States. Apple’s latest iteration of the Apple TV counts for 13-percent of that market share, even though it has only been publicly available for just over seven days. The additional 18-percent is made up of the company’s previous Apple TV efforts, such as the second-generation box, which is still extremely popular due to the ongoing jailbreaking support that’s provided by FireCore and the Seas0nPass tool. Amazon isn’t a much behind Apple, with 28-percent of the analyzed market being held by the company’s Fire TV range. Roku’s latest introduction to the set-top arena has provided the company with a third-place listing with 25-percent, with Google’s Chromecast trailing behind with 16-percent. The data itself has been accumulated from over 3 million shoppers in the United States, before being tracked and finally analyzed to produce the aforementioned statistics. An interesting take away from the report, is that a huge 58-percent of those who purchased the latest ATV, stated that they had not bought any hardware of this nature within the last two years; potentially suggesting that the market has simply been waiting for Apple to once again reinvent the space. What about you? Which set-top-box are you planning on getting this holiday season? Of course they do. It is Apple. I love apple and all its might. To answer the question “What about you” I personally intended to buy ATV4 32GB. ATV 3 is compelling for the price but ATV4 is my choice. Man, why you gotta hate on me? Im trying to change! I really am!! well duh….the millions that buys apple product will of course buy apple tv.